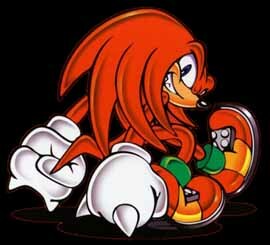 Biography: Knuckles is a red echidna, a cousin to the hedgehog, but Sonic and Knuckles are in no way related. Infact, Knuckles hardly likes Sonic, the two get along, but consider each other as rivals. Knuckles has always packed a punch, but shows what his muscles can really do as the power type for Team Sonic in Sonic Heroes. Knuckles acts all tough on the outside, but inside, he's a gentile creature. Knuckles seems to despise citys for some reason. He is the last echidna of the ancient tribe. The ancient tribe attempted to destroy the Chao and steal the Master Emerald. Chaos stopped them. Knuckles is the current Master Emerald guardian.He also has another difference from the other characters, he wears mittens! Yeah, many people say "spiked gloves" but look at them better, they're mittens. Interesting. He also has a rival named Rouge the Bat, who attempts to steal the Master Emerald, but seems to have stopped really trying and is just attempting to get Knuckles attention.